The dehydrator has even air flow that will dry the produce evenly. Like any other kitchen appliances, dehydrators come in various shapes and sizes, each with its own food capacity and limitations. If you have a large enough space to store the dehydrator and you want to dehydrate a large amount of food, an expandable dehydrator will be the best option for you as it basically consist of trays stacked on top of each other. Actually, some models, such as the Ezidri Ultra can even be expanded by up to 30 trays. 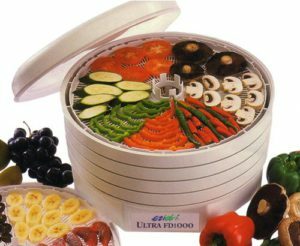 If you are looking at dehydrating smaller amounts of food just for you and your immediate family and friends then a standard dehydrator with a fixed amount of trays would be the best option. Depending on your preference, some dehydrators come with accessories that are quite useful, such as an optional timer, these are helpful to anyone who has a hectic schedule. Timers are known to reduce the risk of over or under drying your food. Other dehydrator models include thermostats to help you select how dry and crisp you want your fruits and vegetables to be. Look for a dehydrator that is affordable, while including all the specifications that you require. Most dehydrators are very affordable and different companies offer various payment methods to make the equipment quite plausible to purchase on a limited budget. At times, especially when produce is in season, it is often sold at a lower price, purchasing in bulk means you have paid much less for the produce, once dehydrated, bulk produce can be preserved for months, even years depending on the produce purchased. When selecting produce to purchase ensure that it is produce that is not bruised or spoilt in any way as this does not produce the best drying results. Pre-preparation of the food helps quicken the drying process. The various methods include blanching and soaking in citrus liquid. These methods are natural ways to preserve food. They can also help fight bacteria, preserve colour and maintain flavour. You can also marinade with salt, spices or sweeten with honey to increase the flavour even further before dehydrating. Before attempting to dehydrate anything, I would recommend that you read the supplied manual and familiarise yourself with the correct temperature settings for drying various foods. Do not keep temperatures too low or too high. If the temperature of the dehydrator is too low it could result in the growth of bacteria on the food. Temperatures that are too high temperatures result in the food being over cooked. Food is completely dehydrated when it has no moisture and feels leathery or rubbery to touch. Vegetables should be crispy and easy to crumble and meat should be tough. Nuts should also be crispy. Before storing dehydrated food ensure that it cools down completely. Store in an airtight container or vacuum sealed plastic bag that do not let in any air. The secret to proper storage is to not allow any moisture in the food as this causes mold. For best results store containers in a cool, dark and dry place. During the dehydration process, as the food loses moisture, it shrinks in size. Food shrinkage during dehydration may cause smaller foods to fall through holes in the drying trays. To prevent this from happening, when dehydrating smaller items such as strawberries, grapes, herbs etc, line trays with mesh sheets. Some foods such as very ripe tomatoes, citrus or sugared fruits may drip once placed on the dehydrator trays. To remove excess moisture gently tap the produce with a kitchen towel. Once the food has been placed, use a solid sheet on the bottom tray to catch any additional dripping.